b).ITI in the trade From Any Government Recognized institution /Board. 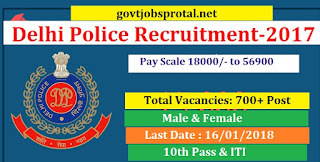 1).Interested and eligible aspirants should apply online application form for Multi Tasking Staff post on official website of Delhi Police @ http://www.delhipolicerecruitment.nic.in or at http://www.delhipolice.nic.in you need to provide all valid information you may also need upload the scan copies of your documents. (ii) Application Fee:- Male Candidates belonging to General (UR)/OBC Category applying for recruitment to the posts should pay Rs. 100/- (Rupees One Hundred Only) as application fee through online payment gateway System. On WWW. delhipolicerecruitment.nic.in and WWW.delhipolice.nic.in. Women Candidates and candidates belonging to Scheduled Castes/Scheduled Tribes, Persons with Disabilities (PWD) and Ex-Servicemen categories are exempted from paying application fee. Fee once paid will not be refunded under any circumstances and the fee paid by modes other than above will not be accepted and applications of such candidates will be rejected forthright and the payment made shall stand forfeited. Subsequent request for its change Will be considered. Competent authority empowered for the purpose. 2).Woman Candidates Disabilities Belonging to Scheduled Tribes persons with Disabilities and Ex-serviceman categories are exempted from paying application fee. b). (You will get more information in employment News paper dated on 16/12/.2017 Page no.(6).) Visit the official website for more information.